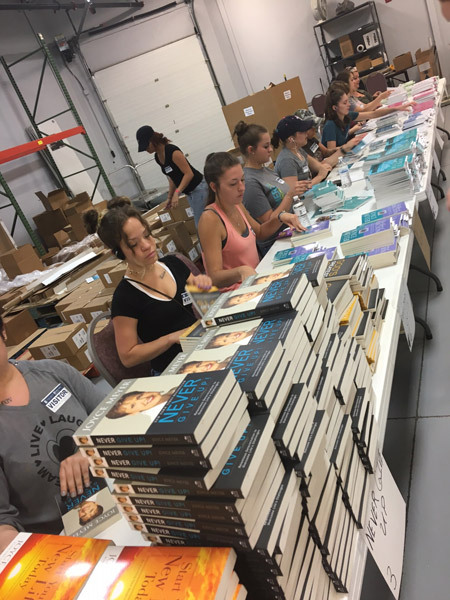 Each month, the St. Louis Mercy Multiplied residents head to a local warehouse and package Joyce Meyer Ministry resources for prison inmates all over the world. Through Joyce Meyer Ministries (JMM), Hand of Hope Prison Ministry has delivered more than 3 million gift bags to inmates worldwide. The Prison Ministry has shared gifts, which include personal care items, a Joyce Meyer book, and the Gospel message, in more than 3,750 prisons in over 50 nations and in all 50 states. 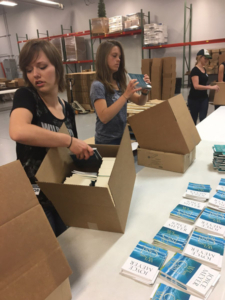 Mercy Multiplied staff and residents volunteer in effort to honor the generosity of Dave and Joyce Meyer. Dave and Joyce Meyer are faithful supporters of Mercy Multiplied and generously donated the property and funding for the renovation of the current thirty-bed St. Louis Mercy home. The St. Louis residents love serving the Prison Ministry. They feel blessed to be a part of the life-transforming impact of the JMM prison outreach. I love that we have the opportunity to help prison ministries around the world. It makes me feel as though I am bringing light into a dark place. This was special and close to my heart having come from institutions. It was great to be on the other side and helping those who are incarcerated because I have gone through the same experience. It has been an amazing experience to be able to bring hope into people’s lives who may feel like there is none. I enjoy being able to make a difference. When I was younger, my dad received a book from prison ministries, and it really affected his and my family’s life. It is cool that I could be a part of someone else’s life like that. My life has come full circle. I remember receiving books like this when I was in prison, but now I can be the change in someone else’s life. Mercy is thankful for the partnership of Dave and Joyce Meyer. For more information on how you or your organization can partner with Mercy, click here.